(1) An application for renewal every two years and a statutory registration fee should be submitted to the Oregon Medical Board before midnight June 30 of every even-numbered year. (2) If applicant fails to comply with section (1) and of this rule, the license shall lapse as per ORS 677.228. (c) Complete 15 hours of continuing education acceptable to the Board for every year the applicant is practicing. The State of Oregon accepts NCCAOM Certification for acupuncture license renewal. For NCCAOM Approved Courses, please visit the NCCAOM PDA or CEU Course page. The process of getting Oregon continuing education credits is simple, convenient, and easy: Download the course, finish the online quiz, and receive a certificate of completion immediately online. You can finish all your continuing education requirements on you desktop, mobile phone, or I-Pad. Reading material are printable. Courses are either in Written format or in a Live webinar. Visit our Acupuncture CEUs page to find out about any other state requirements. 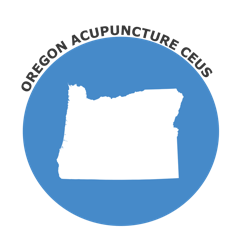 (1) No person may practice acupuncture without first obtaining a license to practice medicine and surgery or a license to practice acupuncture from the Oregon Medical Board. (2) Current certification in acupuncture by the NCCAOM. An applicant will be deemed certified in Acupuncture by the NCCAOM if the applicant has passed the NCCAOM Acupuncture Certification Examinations or has been certified through the NCCAOM Credentials Documentation Examination. The applicant has no more than four attempts to pass the NCCAOM Acupuncture Certification Examinations. If the applicant does not pass the NCCAOM Certification Examinations within four attempts, the applicant is not eligible for licensure. (3) A physician who desires to be approved as a clinical supervisor must meet the requirements of OAR 847-070-0015.